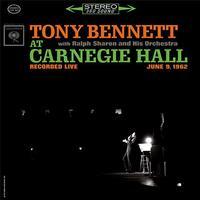 Live in 1962, Tony Bennett at Carnegie Hall, a testament to Bennett's live vocal ability! Mastered by Ryan Smith at Sterling Sound from the original analog 3-track tapes! Hi-Fi News' Album Choice for February 2016! "The original of this double LP set was a sonic spectacular that now sounds veiled and somewhat distant compared to this stupidly, insanely spectacular-sounding reissue cut for the first time from the edited original 3-track tape. Two recorders were utilized, probably either one for backup or for when reels were about to run out of tape. We know the reels were edited both because the complete concert was eventually issued on CD and because here, with the high resolution mastering and jet black backgrounds of the QRP pressing, you can better hear the edits-not that they distract from the proceedings." Music = 10/11; Sound = 11/11 - Michael Fremer, AnalogPlanet.com. To read Fremer's full review, click here. This is it, the live, double record where the magical Tony Bennett created indelible memories! Tony Bennett at Carnegie Hall is the Tony Bennett album to buy for any Bennett fan or those just introduced to his music. And you'll never hear or experience it presented in finer fashion than from this outstanding reissue by Analogue Productions and Quality Record Pressings! We've given Tony Bennett at Carnegie Hall the deluxe reissue treatment. Starting with premier mastering by Ryan Smith at Sterling Sound from the original analog tapes. Originally recorded in 1962, Tony Bennett at Carnegie Hall is a testament to Bennett's live vocal ability, writes AllMusic.com. Backed by the Ralph Sharon Orchestra, Bennett moves far beyond his standard musical catalogue. Along with standards like "I Left My Heart in San Francisco" and "Just in Time," Bennett reached out to create great medleys such as "(I Like New York in June) How About You/April in Paris," that automatically become his as soon as they are performed. Altogether there are 28 tracks on the album. Most remarkable is the clarity of the recording of the concert. If not for the tremendous applause of the audience, you could swear that Bennett had recorded each track in the studio. A masterpiece! This Hybrid Multichannel SACD plays in all CD and SACD players, as well as all SACD-compatible DVD players.